Eggs benedict is one of my favourite breakfast/brunch foods. I absolutely love it! Most weekends, I try to treat myself to a decadent breakfast, whether I go out or stay in. Most weeks I stay in, as German brunch is a continental-style buffet and I really prefer English and American breakfasts such as bacon, eggs, black pudding, pancakes and of course….eggs benny! My favourite variation of eggs benedict is something common on the West Coast (back home for me), which uses smoked salmon instead of bacon. This one pictured above is a homemade spelt bagel (not visible), smoked salmon, eggs and hollandaise sauce with some fresh tarragon and pepper on top. Yummy! Oh my, that´s a very special breakfast. Looks delicious! 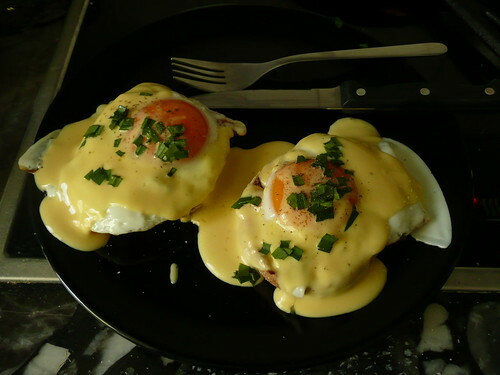 I have to admit, I’m terrible at making hollandaise sauce. I’m still looking for a recipe that I can make successfully, so I use this stuff that comes in a carton…it’s not the best but it’s more passable than the powdered packaged stuff. ← Cupcakes decorated with REAL flowers!